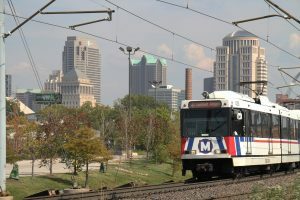 If you have plans to travel into downtown St. Louis this weekend or head to Busch Stadium to watch the Cardinals take on the Dodgers, MetroLink is a great way to avoid lane closures and traffic headaches. Beginning tomorrow night at 8 p.m., MoDOT will close all lanes and ramps on I-44 in both directions between Tucker and 7th & Park. Crews will also close down all lanes and ramps on northbound I-55 from Gravois to the Poplar Street Bridge. Several ramps from westbound I-64 into downtown St. Louis will also be closed for much of the weekend, including the ramp from the Poplar Street Bridge onto eastbound I-44 and the ramp from westbound I-64 onto 9th Street. Instead of stressing out because of the detours and waiting in traffic, relax and let Metro do the driving for you. You can park for free at one of our 20 Metro Park-Ride lots in Missouri and Illinois, and take MetroLink to any of the downtown St. Louis MetroLink stations to avoid the lane and ramp closures on I-64, I-44 and I-55. To plan your trip on MetroLink, use our handy Trip Planner tool or download our official mobile app, Metro On The Go.